Gary Barnett creates his colourful abstract expressionist paintings by combining principles of nature, art and science. Using forced air, chemical interactions and other natural forces to control the paint rather than with brushes, pallet knife and other traditional painting tools, he creates a natural event on the canvas, much like frost on a window, rock formations or the wings of a butterfly. Wow! I was blown away by GARY BARNETT‘s beautiful series of mixed acrylics on board and canvas titled “A Closer Look” that opened today at Urban Gallery (400 Queen St East, Toronto). 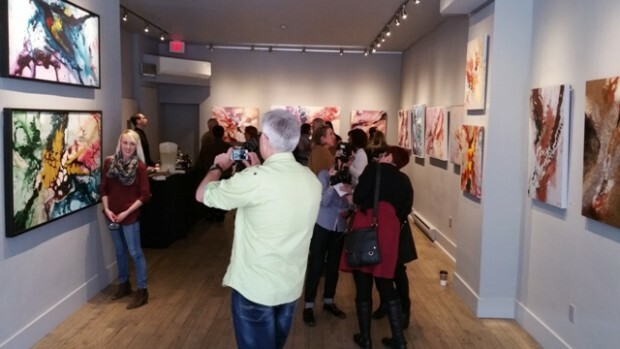 The Kitchener, Ontario, artist welcomed many friends and fans with a wine and cheese reception, and I must say I was under the artist’s spell from the moment I walked thru the gallery door!